The Xanthorrhoea, or grass trees as they are commonly called, were once put in the Lily family (Liliaceeae) but have since been separated into its own family, the Xanthorrhoeaceae. This family until recently included eight other genera, mostly little known in cultivation except Lomandra which is now placed in the Dasypogonaceae or by some in the Lomandraceae (depends on which taxonomist you ask). The genus Xanthorrhoea has 28 species, all endemic to Australia. They come from areas of Australia that generally get 20 or more inches of rain per year although there are Western Australian species, such Xanthorrhoea preisii that come from drier regions. They range in size from small tufted perennials to large trunked tree-like plants. They have erect stalks of white flowers held tight to the non-branching inflorescence - the flowers are very attractive to honey bees. Xanthorrhoea are very slow growing and long lived. Other common names includes balga grass which is an Australia aboriginal name meaning "black boy", alluding to the appearance of the trunks blackened by fire with the fine hair like leaves at the top. The anglicized name has long been "Black Boy" but, though not meant in a derogatory manner, this name has lost favor as being politically inccorrect. These beautiful plants take their time getting big but when they do they can really make a statement in your garden. Xanthorrhoea glauca Eastern Australian Grass Tree - Evergreen heavy trunked plant to10-15' tall x 6-8' usually much smaller w/gray-grgrass-like lvs. Full sun. Drought tolerant. Hardy to at least 20 F.
Xanthorrhoea preissii Western Australian Grass Tree - Evergreen perennial with grass-like foliage that can get 10-15' tall x 6-8' usually much smaller. Full sun. Drought tolerant. 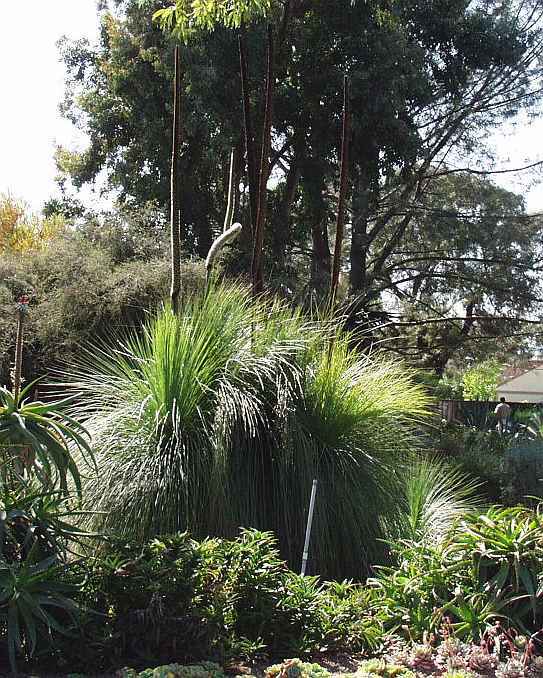 Hardy to at least 20 F.
Xanthorrhoea quadrangulata Australian Grass Tree - Unusual succulent-like plant to 6' tall x as wide w/ grass-like foliage & white flowers on tall spikes. Full sun. Low water needs. Hardy to 20 F.